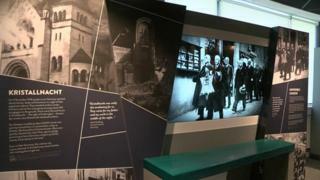 A £1m Holocaust exhibition and learning centre has been opened at the University of Huddersfield. The exhibition contains artefacts from daily life in the Nazi concentration camps and testimony from survivors. Six million Jews and millions of other people were murdered in the Holocaust, before and during World War Two. Trude Silman, a survivor of the atrocity, said: " I think it is important for people to realise that you can lose everything." The Huddersfield centre is not a memorial, but aims to provide learning and research opportunities for school students and communities. Image caption Trude Silman said: "We are all human beings irrespective of our colour or creed." Trude Silman said: "Although what has happened is almost a hundred years back it is still relevant and possibly even worse now because so many people are involved in these atrocities." Originally from Bratislava, she escaped aged nine with her aunt and cousin and arrived in England, growing up in foster homes and boarding schools. She never met with her siblings again. Most of her large family did not survive and others were "strewn around the world", she said. Items from her mother, who is still unaccounted for, have been donated to the exhibition. "We all had very changed or almost destroyed lives," she said. Lilian Black, the centre's director, said: "It's testimony to the strength of the human spirit in adversity, that's why I think this exhibition is really important. "I hope it inspires people and gives people knowledge about how bad things happen and what we need to do to take responsibility for what we are all doing. " Ms Black, also leads the Holocaust Survivors' Friendship Association, and her father was a holocaust survivor. The centre was organised by the Leeds-based association and the university. Image caption Lilian Black said: "A picture tells a thousand stories"